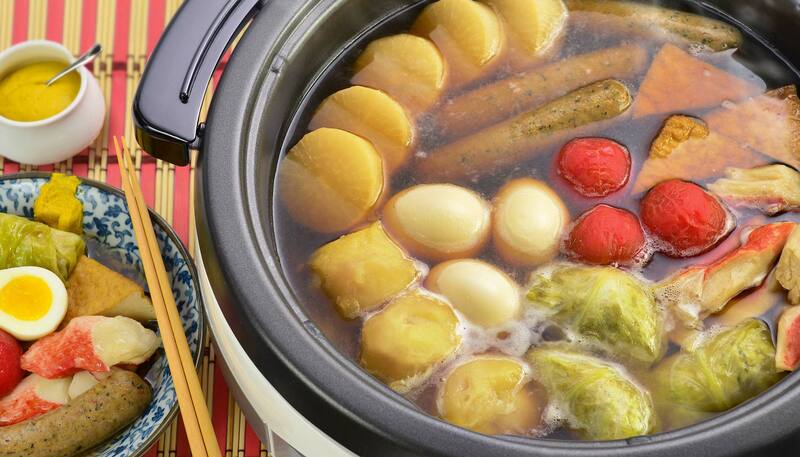 Oden is a stew with a variety of ingredients cooked in clear soy-flavored dashi broth. Commonly served from fall to winter. 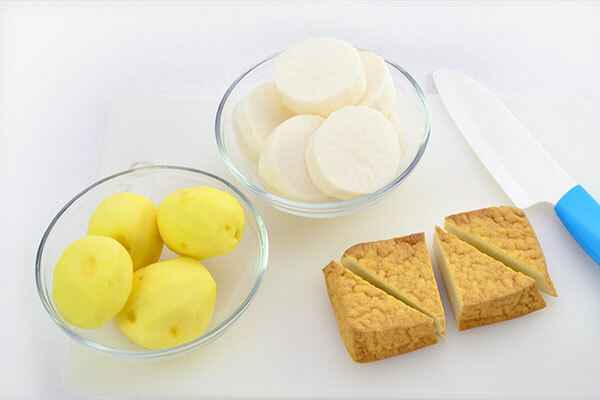 Daikon or fishcake are most popular, but there is no strict rule for ingredients. 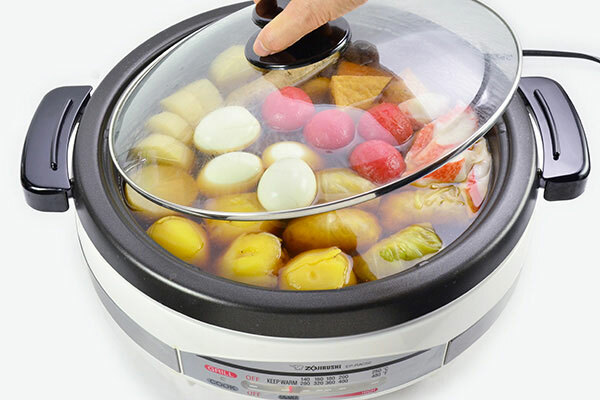 Peel potatoes. Peel and cut daikon into 1 inch thick disks. Cut atsu-age tofu in half then cut diagonally. 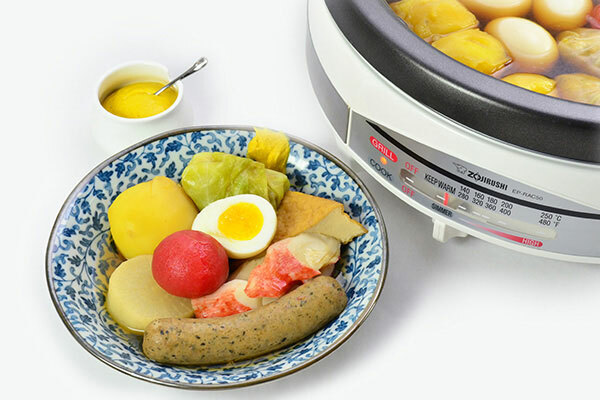 Place potatoes, daikon, atsu-age tofu and all ingredients for broth in the Gourmet d’Expert® Electric Skillet and set temperature to HIGH (480°F/250°C). When the soup reaches a boil, skim off any scum that rises to the surface, place the lid and reduce heat to SIMMER. Prepare the stuffed cabbage. Boil water in a pot large enough to fit the cabbage head. 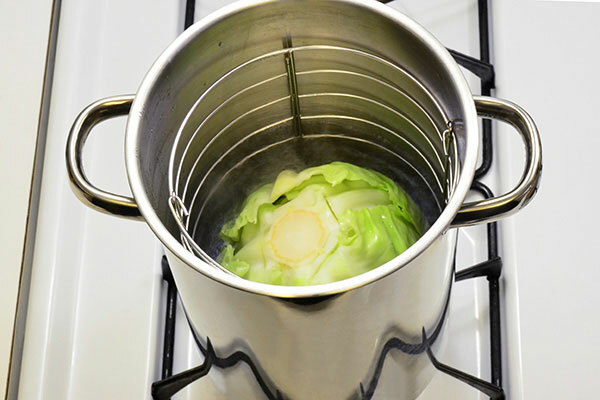 Make deep slits around the core of the cabbage head and blanch in boiling water for about 3 minutes or until pliable. 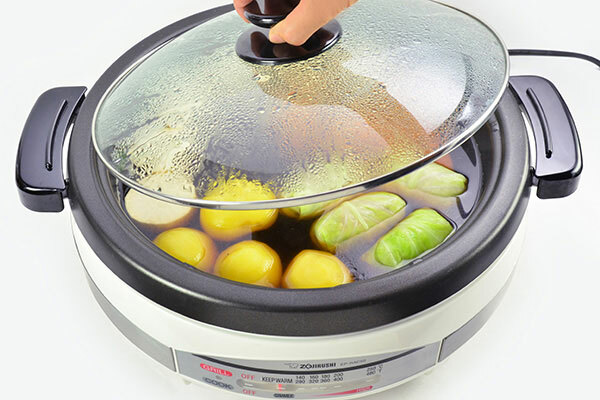 Remove cabbage head from the pot and reserve the hot water. Carefully peel off 4 softened leaves under cold water and set aside (save extra cabbage for other recipes). 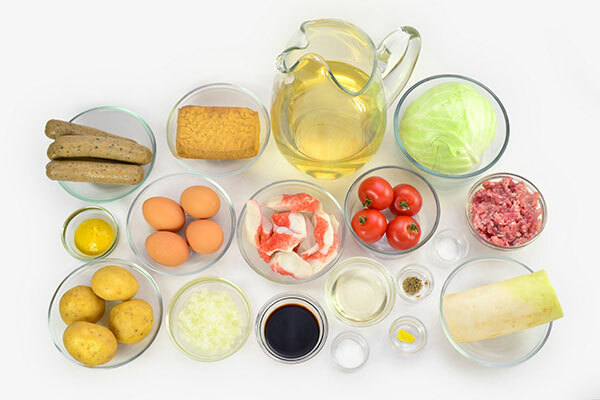 Make filling for the stuffed cabbage. In a large bowl, mix ground pork, onion, ginger, salt and pepper. Carefully shave off thick ribs from peeled cabbage leaves with a knife. Divide the filling into 4. 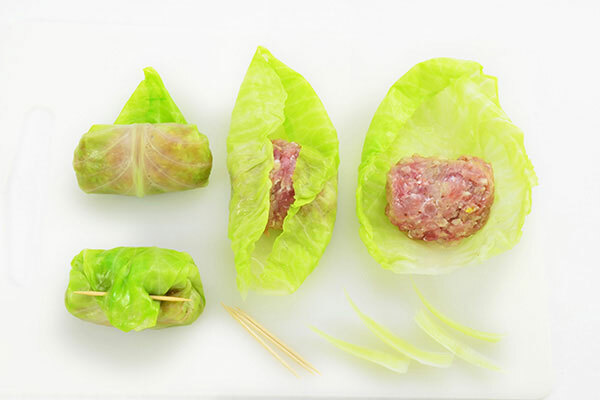 Place one quarter of filling on a leaf, fold both sides in and roll up. Secure the ends with toothpicks. Place rolled end side down in the skillet. 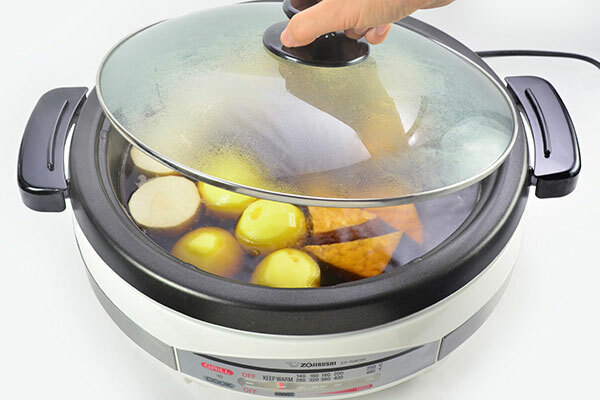 Cover with lid and cook from 30 minutes to 1 hour at SIMMER or until daikon disks and potatoes are tender. Reboil the hot water used to blanch the cabbage head. Remove stems from tomatoes with a small knife. Blanch tomatoes for 30 seconds in boiling water and transfer tomatoes to cold water to peel the skins. 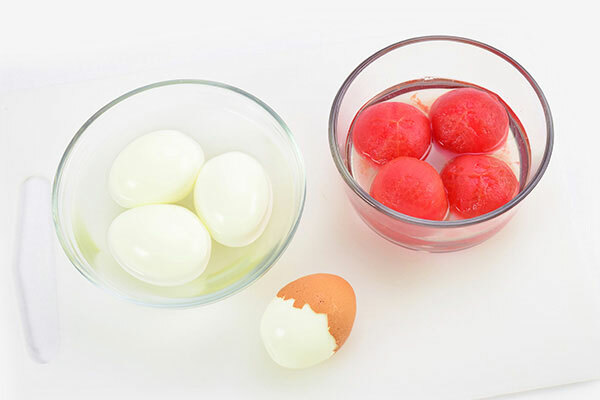 Boil eggs for 6 minutes in the same pot, and peel shells in cold water. Add tomatoes, boiled eggs, imitation crab meat, and sausage to the skillet. Place the lid back onto the skillet and cook for 15 minutes. Serve with mustard and enjoy!